There is so much to see and do in Leeds including the renowned Christkindelmarkt, with traditional wooden stalls & festive greenery. With an abundance of shops and events, Leeds has something for everyone, you don’t need to travel far to have an amazing experience. Leeds is one of the most established shopping areas in the UK including the German Christmas Market, Christkindelmarkt, with traditional wooden stalls & festive greenery. A Christmas carousel ride and twinkling colourful lights all create a unique continental festive atmosphere in the heart of Leeds city centre for Leeds Christmas Market. Set in the stylish civic setting of the award winning Millennium Square, Christkindelmarkt attracts many hundred thousands of visitors to Leeds each year and forms an integral part of the city’s annual events programme. 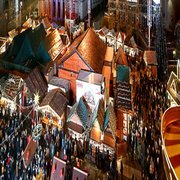 handcrafted toys, jewellery, Christmas cards and festive decorations, specialty foods and traditional German delicacies such as gluhwein, bratwurst sausages, goulash, soups, schnitzels, stollen, gingerbread and candied fruits. Prices are for return coach travel only.